The Spitfire Mk IX was very much a stop-gap solution to an unforeseen new development in the capabilities of enemy fighters, namely the appearance of the Focke-Wulf Fw 190. When the latter arrived at the Channel front in September 1941, this new aircraft was markedly superior to the then-predominant British fighter, the Spitfire Mk. Vb. The next planned Spitfire general-purpose fighter, the Mk. VIII, incorporated several refinements developed in the previously developed Mk. III prototype, and extensive re-tooling was necessary to get production underway. The main improvement of the Mk. VIII, however, laid in the introduction of the new two-stage two-speed-supercharged Merlin engines, and the most expedient solution to make these available to the RAF was to adapt the readily available Mk. V airframe to this engine. Thus, the first 100 or so examples of the Mk IX were simply conversions of Mk Vc airframes, performed either at Rolls-Royce or at Supermarine. As is so often seen, temporary solutions become permanent; so great was the Mk. 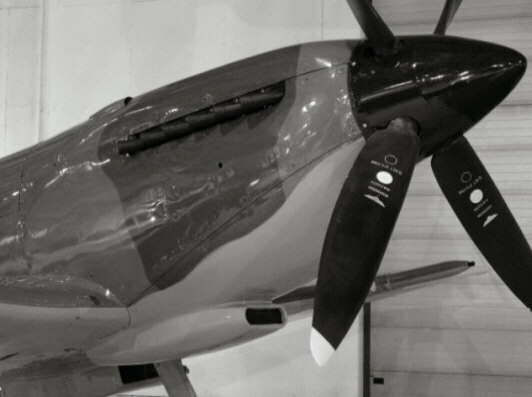 IX’s success that it ended up as the second-most produced Spitfire mark. Counting also the very similar Mk. XVI, the overall production of this type of the Spitfire actually surpasses that of the Mk. V.
One consequence of the rushed introduction of this version was that numerous refinements could be, and were made during its long production run. This made the Mk. IX also the most heterogeneous Spitfire version. I will here try to summarise the main variations of the Mk. IX airframe that I’m aware of. LF IX Merlin 66; two 20-mm. and four .303-in. guns. LF IX (e) Merlin 66; two 20-mm. and two .5-in. guns. HF IX Merlin 70; two 20-mm. and four .303-in. guns. HF IX (e) Merlin 70; two 20-mm. and two .5-in. guns. PR XI Merlin 61; 63, 63A or 70. F XVI Merlin 266; two 20-mm. and two .5-in. guns. (ii) Merlin 61 and 63 engines have S.U.float-type carburettors, but on Merlin 66, 70 and 266 engines these are replaced by Bendix-Stromberg injection carburettors. (iii) All these marks of aircraft are fitted with Rotol 4-bladed hydraulic propellers and on the majority of aircraft the wing tips are clipped. (iv) Later Mk. IX and XVIs have “rear view” fuselages which incorporate “tear-drop” sliding hoods. Semi-officially, however, other suffix letters have also been used to describe these aircraft. The use of the “c” suffix is fairly established today to distinguish aircraft with the universal wing and the standard armament of two belt-fed cannon and four .303-calibre guns – typically carried by series production Mk. IXs, although the intended “c” type was four cannon and no machine guns. More rarely seen are the suffixes A and B. These have caused some confusion, as these letters in earlier Spitfire marks define eight-gun and two drum-fed cannon and four machine gun armament configurations, respectively. It would seem that the designations IXA / IXB were used ad-hoc by the RAF units during the early part of the Mk. IX’s operational career, to distinguish the low-altitude-optimized Merlin 66-equipped LF IX (called Mk. IX B) from the initial Merlin 61/63/63a-equipped F IX (called Mk. IX A). These designations are sometimes seen in pilot’s log books, squadron Operational Record Books, etc. The following table shows the typical factory engine installations in some of the Mk. IX production serial blocks. MH some M61, some M63, mostly LF IX with M66 from MH370 onwards Mostly no? Early Spitfires Mk. IX had a teardrop-shaped blister low on the starboard engine panel, just behind the spinner, similar to the blister on the Spitfire Mk. II associated with the extra bulk of Coffman cartridge starter gear, which connected to the propeller reduction gearbox. The two-stage Merlin versions of the Spitfire, Mks. VII, VIII, IX and XVI all had the vastly superior electric starting. The blister in this case reflects the provision on some of these engines for a cabin blower driveshaft. This was only put to use in the pressurised Mk VII, but the Merlin engines 61, 64 and perhaps 63A were provided with cabin blower drive, and therefore required this blister, while Merlin 63 and 66/266/70 didn’t. Later examples of the Mk. IX, probably because they were equipped with Merlin 63/66/70 engines from the start, lack this small bulge. Later on, early production machines overhauled and re-engined to Merlins without the driveshaft could, of course, very well retain the cowling panel and thus the blister. It would seem that the blister disappeared in production some time during the late 1942 or possibly early 1943, so that most machines in the BR/BS/EN serial blocks had them while later machines wouldn’t. Exceptions are to be expected, for instance because the cowling panels were interchangeable (albeit often ill-fitting when swapped between aircraft). I have seen a picture of a Mk. IXe carrying the cowling blister, but this definitely is a rather rare occurrence. On a very few and very early Mk. 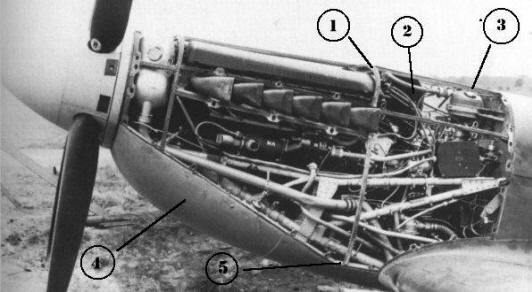 IXs, the upper cowlings were adorned by a pair of rather ungainly bulges, not unlike those of Messerschmitt Bf109G-6. These were positioned on both sides of the cowling above and behind the exhausts. The starboard bulge incorporated a cooling scoop for the Heywood compressor, different from the scoops seen on the “standard” later cowlings. Judging by their occurrence, it would seem that these cowlings were part of the Mk.Vc-to-IX conversions performed at Rolls-Royce in 1942. It looks like the original short Mk.V cowls were stretched by adding about nine inches to their rear, leaving a noticeable joint line. 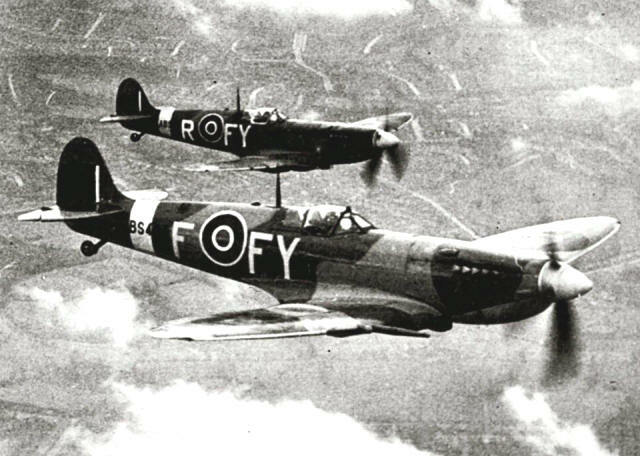 A fragment of a rather well-known photo showing Spitfires Mk. IX of No. 611 Squadron over London. Careful scrutiny reveals that the FY-R in the background has the earliest type of cowling with add-on bulges and is therefore one of the early converted Mk. Vs produced before production jigs for the longer Mk. IX cowling became available. These blisters were introduced to provide space for the enlarged supercharger unit of the two-stage Merlin. The enlarged blower took a lot of space behind the engine, the intercooler casing protruding above the line defined by the top contour of the engine. When Mk. V cowlings were used as basis for the new nose, more room was needed in the rear to accommodate the new item and so the makeshift bulges were “invented” as a temporary measure. This photo of a late Merlin 66-powered aircraft illustrates the problem of fitting the intercooler casing which necessitated enlarged cowlings compared with earlier Spitfire versions. Later production Mk. IX cowling was designed with a slight “hump” along the entire upper cowling contour which provided an elegant solution to this problem. Another peculiarity of the “bulged” cowlings were the rather different panel division lines. Again, this feature originated in Mk. V cowlings being simply extended at the rear to make room for a longer engine. One of the earliest Rolls-Royce(Hucknall) Mk.Vc-to-IX conversion with cowlings removed. From the above photo of a Rolls-Royce (Hucknall) Mk.Vc to Mk. IX conversion, the additional cowling support frame is evident (1). Also visible is the intercooler unit (2) introduced with the two-speed two-stage supercharged Merlin 61 engine. Recognizable is also the associated bulkhead-mounted glycol header tank (3). The new continuous lower cowling panel (4) replaced the exposed oil tank of the Mk.V. Finally, note the kinked panel line resulting from the adaptation of the original Mk.V cowling to the longer Mk.IX nose (5). 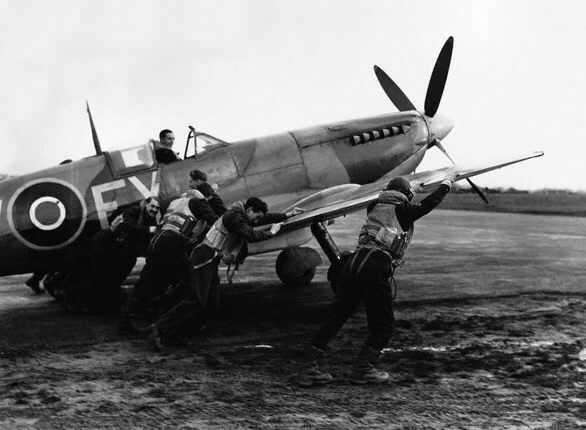 The earliest Spitfires Mk. IX emerging from the Supermarine Eastleigh production line during the same period as Rolls-Royce produced their conversions also seem to have had an interim cowling configuration. There were no extra blisters, but the various small bumps of the Mk.V cowl seemed to have been retained instead. I’d be grateful if anybody could provide more information on the cowling configuration of these early Mk.IXs. The upper contour of the cowling of Mk VII/VIII and early Mk IXs was a fairly straight continuation of the line of the upper fuel tank panel in front of the windscreen, falling smoothly toward the nose. Looking closely, one will observe a very slight rise from the fuel tank towards the position of the intercooler (just aft of the exhaust stacks). On later production examples, and particularly on all Mk. XVIs, this swelling in the upper engine panel contour had been significantly exaggerated, to the degree which made it visually obvious (the upper cowling shape was not only changed not only in profile, but also got more volume in the space housing the cylinder heads, just above the exhausts – Ed.). Late production Mk. IX and XVI cowlings had been enlarged in their upper part resulting in the distinctive bulbous appearance, evident from this angle. I have not been able to find any “official” explanations for this change, but there must have been some good reasons as forward view from the cockpit was limited enough as it was. The modified contour is typically seen on Spitfires Mk. XVI and many Mk. IXe. One hypothesis is that the enlarged upper cowling was introduced in the Mk. 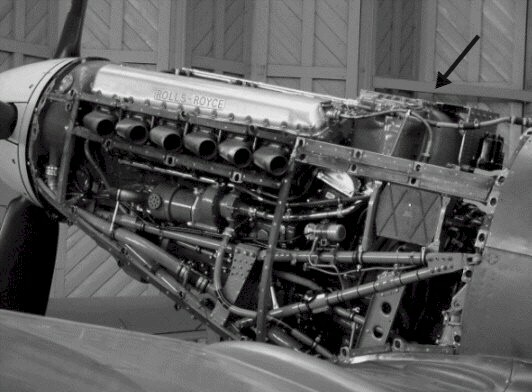 XVI design to make room for the modified intercooler of the Packard-built Merlin 266, which in this version of the engine had an integral header tank. The British production Merlin 61, 63, 66, and 70 had a flat-topped intercooler and a separate, firewall-mounted header tank. Of course, once a modified cowling was designed, there was good reason for using it also in the Mk. IX production. In fact, the Mk. XVI was built in parallel with the late Mk. IXs on the same Castle Bromwich assembly line. The difference in header tank configuration between the Mk. IXe and Mk. XVI is also reflected in different positioning of the filler cap access panel. As far as I’m aware, this might be the only external difference between the two marks. Most kits and drawings show this hatch in the forward position, perhaps due to the fact that many currently flying examples use Merlins with the integral tank. Test pilots evaluating late Mk. IXs and the Mk. XVI suspected the “balloon-shaped” cowling to be detrimental to aerodynamical stability. From top to bottom: (1) short Spitfire Mk. V cowling which was the starting point for the Mk. IX. (2) Initial Mk. IX cowling produced by Rolls-Royce through straightforward extension of the Mk. V nose. (3) Early production Mk. IX cowling. (4) Enlarged late production Mk. XVI and Mk. IX cowling. W.r.t the Spitfire’s cockpit door, I find this an interesting feature. Not so much the concept of the door as the Gladiator had one and it is not unique as such, but the latch mechanism is quite clever. Recalling the SAAF Museum MkIX, the latches had two notches in them, so this meant the door could be held slightly open, which was a way of locking the canopy open as it interrupted the LHS canopy rail channel. If carrying out a forced landing, this would prevent the canopy slaming shut under rapid deceleration. For MkXVIs and bubble top Mk IX’s, this was significant as the canopy is much heavier. Slamming closed, coupled with then jamming due to crash fuselage distortion could dangerously delay an emergency egress. So an interesting feature to the door. I recall it as an easy to use system and it was very handy to open during taxi for easing lookout and allowing for a cooler cockpit! Can anyone tell me, the early converted Vc to IX, did any of them get the Merlin 66, or were all Merlin 66 LF versions production models of the IX? Looking for a photo of Spitfire EN666 or one similar used by 17 (training) Group, Coastal Command, Haverfordwest in 1945. Can you please help.